The recession has most of America in its clutches, but it’s not time to roll over and play dead. It’s time to be proactive! The magnitude of the this calamity causes people to have a great deal of stress and anxiety over their financial situations. They react to this stress and anxiety in a variety of different ways — unfortunately among them is denial, paralysis, and sticking their heads in the sand. It doesn’t have to be so. I hope that the main thing you come away with from this series is that you can be proactive; you can maintain control over your life even in the worst of times. This is the fourth and final part of a four-part series on “Surviving the Recession.” Today’s installment has 16 tips to help you regain control of your finances, your emotional life, and your relationships. Yesterday’s post, “Surviving the Recession, Part 3: 15 Things You Can Do to Regain Control” has 15 more tips, for a total of 31. The tips are presented in no particular order. They come from over 20 different sources, each with a particular point of view. There may be some overlap, there even may be some contradictions, but there is a wealth of good advice among them. How are people handling the recession? It is important that you take stock of yourself and your behavior during these tough economic times. Stress and anxiety caused by money can lead you into activities that generate even more stress and anxiety. For example, it is all too easy to try to relieve stress by turning to unhealthy activities like smoking, drinking, gambling or emotional eating. Fear is a very powerful motivator, but you should never make a financial decision in the heat of the moment or during an emotionally charged period of time. Remain calm and stay focused. If you are too stressed out and anxious to make decisions, it’s ok to step back from the situation and take a breather. While it’s important to make plans and take action, there are times when pausing to catch your breath is the best thing you can do. If you have investments, use the current economic situation to better understand them and make decisions for the future. But do not make any rash decisions right now, such as selling your stocks, which will only lock in losses. Better understand what kind of investor you are and need to be. Are you: conservative? risk-taking? What part of life are you in and how does your investing strategy match what you need to be doing? Build a better portfolio. Is your portfolio balanced properly? Do you have 90% of your portfolio in stocks? Or are you overloaded with bonds? What kind of balance do you want and need not only now, but in the future? Research the funds you own and use this knowledge to fully understand what you own rather than always counting on an “expert” — you’ll build confidence and feel better. If your 401(k) is your only savings consider a balanced approach: part stocks, part bonds. Look at the different ways to invest your 401(k). Learn about the stocks and bonds that you have invested in. If you do the research, you’ll feel much better about your future. Review what you have with your spouse or partner, make decisions for your own time horizon, and you’ll sleep better at night. Nobody likes uncertainty. It makes us uncomfortable in the best of times. And in the current economic crisis it is easy to have your faith in the things you hold most certain shaken. Finding and building on the certainties in your life will go a long way toward relieving your day-to-day stresses and anxieties. Examine your life to find out what the bedrock values and activities are that serve to create certainty for you. Look at your values to ensure that the life you lead is the life you want. Is it your family? Then maximize the time and the quality of interaction with them. Have you kept up with your friends the way you want to? How about personal development? Have you set it aside for more “urgent” things? Is there an organization, such as a church or charity, that you want to devote more time to? Do you have a neglected hobby or favorite pastime? The list could go on and on; you probably have more in mind right now. The one thing that they all seem to have in common is that they cost little or no money to cultivate. That’s the irony of the current financial mess: as they say, the best things in life are free! Slavish adherence to long-term plans gets us attached to specific outcomes, when it’s possible that other outcomes we haven’t explored would be even better. Consider whether your long-term plan is actually keeping you from actuating your values by being too rigid. In a world that is constantly changing financially, technologically, and in every other way, you could miss out if you are chained to a long-term plan. Think about making your long-term plans much shorter to take advantage of new possibilities and opportunities that are constantly presenting themselves. Would a better “long-term” plan be 2 years? 1 year? 9 months? And in the current recession, which is already easing up, it might be folly to commit yourself to a 5- or 10-year plan when things are changing so rapidly. Only you can determine whether a shorter plan meets your needs and your level of comfort — but it’s something to think seriously about. When our financial decisions are so crucial to the well-being of our families, it is easy to fall into the error that we cannot afford to make a mistake. Ironically, this attitude leads to indecision, denial, and paralysis: if you can’t afford to make a mistake, maybe it’s better if you do nothing at all. In the current financial situation, no one can really know what the future will hold. All we can know is what is at our feet in this journey called life. Every step we take, no matter how well thought out, no matter how well-planned, is in its essence an experiment. And experiments fail just as often as they succeed. All we can do when we fail is to pick ourselves up and use the failure as an opportunity for growth — and for taking yet another experimental step. You cannot get away from the fact that every step you take is experimental. All you can do is to accept the fact, or try to deny it by insisting that every action you take must be error-free. Some people are prone to being perfectionists, particularly people with one of the Anxiety Disorders. They want every little “i” to be dotted precisely and every “t” crossed exquisitely. They want their plans and actions to take in every bit of information possible. Unfortunately, perfectionists don’t live in the real world. It is impossible to have digested every piece of information or considered every option before acting — to think that you can is just setting yourself up for failure and disappointment. And more stress and anxiety. Perfectionists know this in their heart-of-hearts, and often are the biggest procrastinators and do-nothings on the block. To take no action is mistaken as taking no incorrect action, when taking no action is a choice itself. It goes almost without saying that such an attitude leads to yet more anxiety and stress. I would argue that [an average outcome] is better than nothing, You don’t have to get too complicated; just do something. One of the big problems people face in this recession is embarrassment, particularly if they have lost their jobs or have experienced a big financial reversal. What used to be chump change is the sum total of their unemployment checks. They are struggling to feed their families and keep a roof over their heads, perhaps for the first time in their lives. They don’t know where to look for help. But embarrassment is not reserved only for those fallen upon hard times. Many of us find we are over our heads when we try to get a handle on our finances. Perhaps we are not good with numbers, or don’t understand our options. Maybe our finances are in such a mess that we don’t know where to start. Or maybe we’re embarrassed that we are not doing as well as the guy next door, or our sister, or our parents. One hang-up people have is they’re ashamed that they’re not more organized with their money and feel too embarrassed to contact a professional adviser. But a good adviser won’t be criticizing you, even if you bring in all your statements stuffed in a brown paper bag. It would be nice if we had all the resources within ourselves to cope with the stress, anxiety, fear, and uncertainties of this financial crisis. But we don’t. Not one of us. Americans are taught from the cradle to rely on ourselves, to be independent, to grit our teeth and power through every storm. We just aren’t very good at asking for help. It’s easy to neglect your family when you’ve just lost your job, or you have had to take a big cut in pay. The stress and anxiety you feel is felt by them, too. Tensions mount, you and your spouse argue, and the kids break into tears. Be sure to continue to demonstrate your love and appreciation to loved ones. Hold a family meeting to discuss the situation and to agree on things each one can do. Sort out resentments, angers, and fears. It is much easier to bear a burden when it is shared with your family. Often we think that the stress and anxiety of big financial changes are the province of you and your spouse or partner. You wait until the kids are in bed to discuss finances. No matter how successful you think you are in keeping the bad news away from them, children will know that something is not right, and that mom and dad are very upset. The children will not understand, and will think that they have done something wrong. They will transfer your fear, stress, and anxiety into their world where it will become acting out, bad grades, bedwetting, and a host of other ways that children have of expressing emotional upset. Work on your own stress and anxiety, but don’t try to hide it from the kids — they will know something is wrong. Reinvigorate your efforts to show your love and attention to your children. Do not, among all your cares and woes, ignore them or take your frustration out on them. Many people in this recession have lost their jobs, and many more fear they will lose them or have their pay cut. Now is not the time to hide away, hoping that the axe will not find you, but to showcase yourself. Demonstrate your value to the company’s bottom line. If you’re not in a position that creates or saves money, offer to take on a job (even if it’s extra duties) of a position that does. Most importantly, position yourself for the next big thing. If you’re a banker, move into workouts. If you’re in manufacturing, become the “savings chief.” If you are in sales, learn about new products outside your range of expertise. The adrenaline that you are feeling when you see the stock exchange plummet is the amygdala going into fits, spreading fear to every part of your body. It gets you ready for what is called the “fight or flight” reaction. The problem is that stress and anxiety keep the amygdala in a constant state of alert, draining you of energy — both physical and emotional. Relax your muscles by shaking your arms or legs. If you can’t do this, flex and relax the muscles in your arms and legs. If you are hyperventilating or over-breathing, try to hold your breath as long as you can to prevent the dissipation of carbon dioxide. You can’t really ignore your amygdala, but you can take steps to reduce its impact on your life. The stress, fear, and anxiety of the financial crisis can take over your life. You need to get away from it, to occupy your mind and body in some way to give them a break from worry. There are many ways to distract yourself — you know the best ways. For some people it is a hobby, for others bad TV movies, and for yet others, yard work. My mother knitted. After her two open heart surgeries and the death of my father, she knitted continuously. For many years on every occasion that called for a gift, she would present an afghan, a sweater, or a scarf. People got tired of them (we have a closet-full that we just can’t give away), but we all understood that she was knitting as a way to distract herself from the physical and emotional pain she was experiencing. I can say without hesitation that knitting added many years to her life. In the final analysis, you will have to trust yourself to come out of this financial crisis relatively unscathed. That doesn’t mean that you won’t face economic hardship, but that you will come out on the other side stronger and without emotional scarring. Trust and confidence in yourself can be built. Looking the situation square in the face, realistically planning and executing your plans will give you trust in yourself. Even when you fail — and you will from time to time — self-trust will help you pick yourself up, dust yourself off, and keep trying. Focus on building trust in yourself rather than giving in to the effects of stress and anxiety. Look at the economic crisis as a way of making yourself stronger and more fit to take the opportunities that come your way. Build trust in yourself that you can face any obstacle and get past it unharmed. You know that the recession will run its course, and the country will be back on its feet again. The trust you build now will make you a better and more emotionally fit person when it does. Be sure to read the other parts of the series! This is the fourth and last part of a four-part series on “Surviving the Recession.” Yesterday’s post, “Surviving the Recession, Part 3: 15 Things You Can Do to Regain Control” has 15 more tips, for a total of 31. Did the series have to be so long? Could I have left out material and still have the same authority and impact? Should I have split the sections — especially the tips — even further to aid readability? The tips might have been better as 3 parts. Are the tips too wordy? I wanted each to be able to stand on its own, so often found myself saying some of the same words in some. If you have any thoughts on these questions and others I should have asked myself, I would really appreciate if you were to leave a comment or use the contact form at the top of the page to email me privately. Which is your favorite tip today? Do you disagree with any of the tips presented? Could you add any tips of your own? Artwork by Andy Warhol. 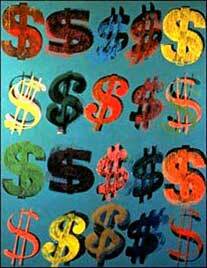 “Dollar Signs,” 1981. Silkscreen on canvas. Good job, Mike – this is a very comprehensive post and I’m sure alot of people will find it incredibly useful. Glad you found the thoughts on Agile Living useful too. I think alot of this is the life skills that we’re going to need, in order to thrive in this next era – not just this recession. Thank you, Cathy, for your comment and the compliments! I wish I could have used more of your ideas, but the post was already way over 4,000 words. I actually had already written it when I was directed to your post by Twitter (I think). It was so good that I just had to include at least one of your thoughts. I agree about these being life skills that we need in general. As I was writing the lists (parts 3 and 4), I kept thinking that these items were, for the most part, just good advice for everyday living. I wish there were a forum where I could expand upon them in that sense — I obviously can’t do it on an Anxiety Disorders blog! Tom, thank you for the comment and compliment! I appreciate your comment about the layout. I use the Thesis theme, but have not done much obvious customization. I like a very simple, clear layout that radiates peacefulness. Thank you, Mike, for the compliment! I used well over 20 sources for these tips, and could have actually included more. But at 31 and 2 very large parts it was getting pretty unwieldy already. If there is sufficient interest, I will write a followup with more information and tips. Thank you, Mark, for the compliments! I am really glad you like AP&H and hope it will be of benefit to you. If there is a subject you would like covered, please feel free to email me directly using the “Contact” tab at the top of each page. There have been several posts covering topics that readers requested. In fact, I am working on one now about biofeedback and Anxiety that will be finished later this week. Your posts are really relevant to me ! Its teaching me alot as I am trying to start a blog now myself! Please do continue posting! Thank you, Nicholas, for the comment and the words of encouragement! Please feel free to explore the site. Start with the “Most Popular” and the “Recent Posts” lists in the sidebar. Then check out the “Categories” tab at the top of the page. Specific topics can be found using the “search” facility in the sidebar. The “Reference & Info” list in the sidebar has longer background articles about the various Anxiety Disorders. If you’re interested in a topic you don’t see covered, I would welcome your suggestions! Just email me using the “Contact” tab at the top of each page. These are all fabulous tips. What I’ve learned to do is not watch the news, but instead look around for what I believe are signs of recovery (in the economy). Although I am also realistic, not watching/hearing the doom and gloom helps me to keep a better, more positive attitude on a daily basis. Thank you, Barbara, for your comment and the compliments! Both my parents grew up on farms in the Great Depression. They had the expected tales of want and privation, but they also had many stories of close family ties and shared experience that working through problems produced. My mother’s family, in particular, is still extraordinarily close. It’s an old saw that the best things in life are free, but it’s also very, very true. Although great family memories can come from expensive vacations, equally wonderful relationship-building memories can arise from no-cost experiences together. There is no reason why rich family traditions cannot arise from times of economic hardship; in fact, I would think they would be more likely to arise if we just take advantage of the opportunities presented to us during these times. I came here via your Thesis Theme tools page to look at your footnotes plugin in action and I got a great deal more than that! Wonderful article. Thank you . Life really does have a way of giving you what you need. Hello, Neat post. There is a problem along with your web site in web explorer, may check this? IE nonetheless is the marketplace leader and a good part of people will pass over your great writing due to this problem. Hi, was delighted to discover this kind of website. Actually only just found it through aol however wasnt looking for nearly anything related particularly to that actually, though I liked checking through to your things had to state. Thx! You really make it seem really easy together with your presentation but I find this matter to be actually something that I think I might by no means understand. It sort of feels too complicated and extremely extensive for me. I’m taking a look ahead in your next publish, I’ll try to get the grasp of it! Together with almost everything that seems to be building throughout this specific subject matter, your viewpoints are actually very refreshing. Nonetheless, I am sorry, but I can not give credence to your whole plan, all be it stimulating none the less. It looks to us that your remarks are generally not entirely rationalized and in actuality you are yourself not totally certain of the argument. In any case I did enjoy looking at it.